For most of you, today is Christmas. For some others, it’s just a Thursday. For that first group, I hope you get everything you asked for this year, and one or two things you didn’t. After all, what fun would it be if you just got everything you asked for. You gotta have a few surprises in life. Christmas is a great time for surprises. I didn’t ask for too much this year and I was lucky enough to get everything on my list. The truth is, though, all I really wanted was for my family to be healthy and happy, especially our youngest member. His health and happiness is my first priority. I guess I must have been pretty good in 2014 because I’m happy to report he’s doing great. Sure, 2014 had a few rough spots (very rough, let’s face it) but those times haven’t dampened my enthusiasm, or my optimism, for 2015. In short, I’m looking forward to the new year and all it will bring. 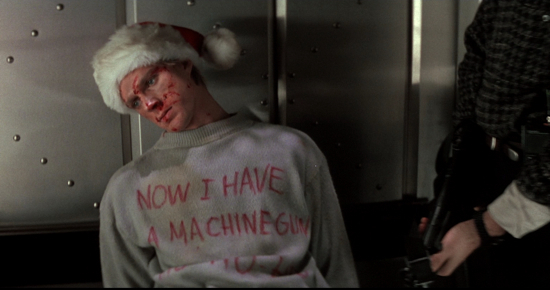 Until the new year, though, I’m going to pass the time enjoying a few of my favorite holiday movies. I’ll give you a couple guesses what some of those might be. You can also hear Joe and I discuss our favorite holiday movies, and whatnot, on the latest episode of The Flickcast. Happy Christmas and best wishes for a spectacular 2015! Don’t worry, I’m not only watching action movies during the holidays. This one has almost no action at all, except the bedroom kind. Plus, it has Rick from The Walking Dead and Hans Gruber from Die Hard. That’s gotta count for something. This entry was posted in Christmas 2014, family, Holidays, Personal and tagged Alan Rickman, Andrew Lincoln, Bruce Willis, Christmas Movies, Danny Glover, Die Hard, First Blood, Hans Gruber, Lethal Weapon, Love Actually, Mel Gibson, Movies, Richard Crenna, Rick Grimes, Sylvester Stallone, Trailers, xmas, Xmas 2014. Bookmark the permalink.